Intratday Trading Trend is a Binary Options Strategy One Touch that works following the Trend with Trend bars indicator based on T3 indicator. Rules for:Binary Options Strategy: Intraday trading Trend. Time Frame 30 min exiperes time 120 min. When these conditions are agree, Buy call option on, the touch point is the next level of the Pivot Points Levels. 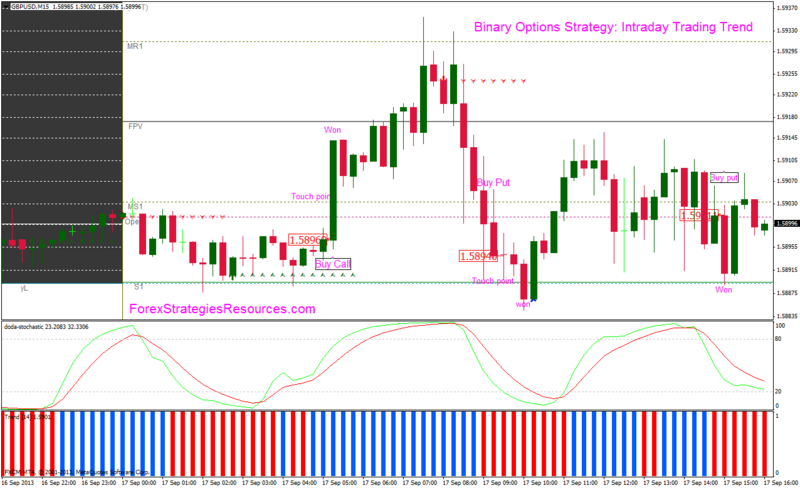 In the pictures below Binary Options Strategy One Touch: Intraday Trading Trendin action. Hi, What metatrader 4 do you recommend because the files I've download doesn't work. Intrday trading Trend, Binary Options Strategy One Touch.